50 Cent has upped his hustle over the years and is expanding his business empire and one of the National Basketball Association's (NBA) top superstars, Carmelo Anthony has become a partner and brand ambassador for SMS Audio, a company headed by 50 as CEO. Curtis ‘50 Cent’ Jackson, today announces that six-time NBA All-Star and NCAA Champion, Carmelo Anthony joins SMS Audio as an investor/partner and advisor. 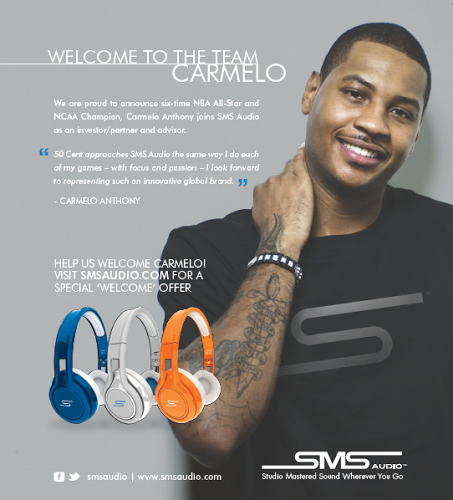 As part of his newrole with SMS Audio , Anthony is also a brand ambassador for SMS Audio worldwide.